Welcome to FONA’s new website. This site redesign aims to bring you more up to date content from across all the programs and communities with whom we are involved. We see this evolution of our online presence as necessary for our work, but also as the outcome of it. 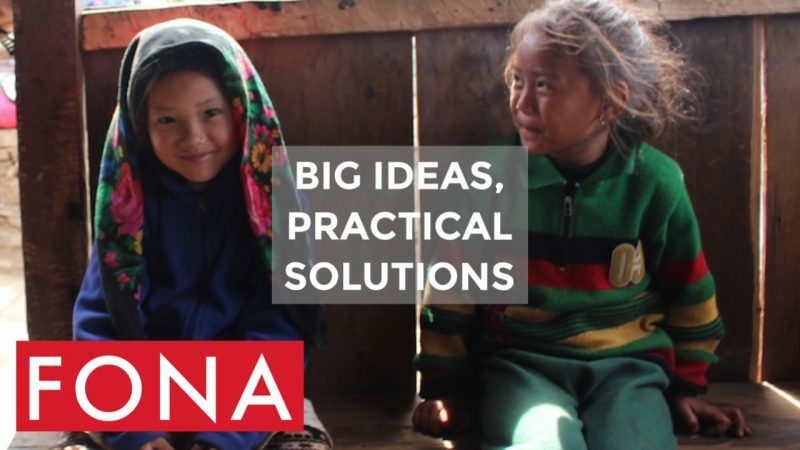 Since launching in 2015, FONA’s mission has been clear: to design, drive & influence models, policies & initiatives that empower developing communities to create their own thriving future. We are delighted to say that our programs and projects are well underway, our partnerships growing, and the new expanded website structure and content demonstrates our approach and provides more information about our work and model. You may notice also that we have changed our tagline. This is now “Big ideas, practical solutions”. We wanted to use the tagline to summarise our approach – not only do we focus on connecting the best minds to address a problem, but we are also passionate about making it happen, by using the deep insights we have about the communities concerned, and ensuring they are empowered to deliver a real result. Take our flagship Education Centre of Excellence for example – whilst the planning phase was a highly consultative and collaborative process, we are following through to delivery, with stage one construction commencing in a matter of weeks. Both the solutions we deliver, and the ideas that underpin them, could not be realised without partners, and it is partnership that is accelerating the change we seek to deliver. Not least our partnership with Nepali communities and the government, but also the invaluable help from experts at the University of Melbourne, UNESCO, Cohere, Thrive Research Hub, TAFE and Includesign, amongst other organisations. These partnerships have been crucial to getting key flagship projects like the Education Centre of Excellence at Purano Jhangajholi and the heritage rehabilitation at Changu Narayan off the ground. One of our goals for 2017 is to expand our supporter and partnership base. We see this as an imperative if we are to undertake more of these community and partnership-led projects. We want to share our innovative and collaborative model as widely as we can, creating new, effective strategies for international development around the world, all of it designed to deliver long term impact, and give people the opportunity to thrive and achieve their full potential. Nepal is the current focus for all our work, and will continue to be central to FONA. Whilst we are using more our short name – FONA – rather than the full ‘Friends of Nepal Association’ this is just so that other countries do not feel excluded from potential partnership with us. We are deeply connected to the Nepali community, and have learned so much already from our work with them, that we look forward to applying our knowledge to many more projects in Nepal, and beyond. We are convinced that a profound understanding of the culture and community in which we work is critical for success. Thank you for your support of FONA at this exciting time and we ask you to help keep the momentum going. Take a moment to look around the website – perhaps start at the homepage – including our recent blogs on the Benefit Mindset or the principles of Regenerative Design that help inform our work. Share this website, like us on Facebook or other social channels if you haven’t already. If you like the programs we are undertaking, or the model we have adopted to work with Nepali communities, share that with your friends and colleagues.